TIGG offers virgin coal, wood, and coconut shell based activated carbon filter media which can be used for removal of trace particles that occur in air or vapor streams. TIGG also provides reactivated coal based granular and pelletized carbons. Vapor phase activated carbon adsorption media have a high activity level in combination with a selection of transport and adsorption pores that accommodate adsorbates of varied molecular sizes. Activated carbon media can be used to recover solvents, remove VOCs from the air in tank vents, air stripper off gas, soil venting, and remediation of vapors generated when soil is being remediated. 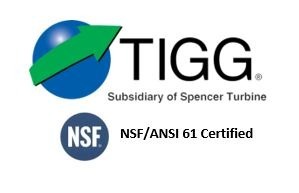 TIGG also has specialty impregnated activated carbon filter media for removal of sulfur compounds, mercury, ammonia, and amines. Click on the TIGG product name to download PDF. Various particle sizes, base materials, and activity are selected for pressure drop and application parameters, including type of contaminant and concentration. Traditionally, coal-based activated carbon filter media have been preferred as they provide excellent performance for a broad range of contaminants and a wide array of concentrations.Â Coconut carbon filter media have generally performed well with low boiling point, low molecular weight compounds at lower concentrations. The smaller mesh sizes are for units with lower design maximum flow ratesÂ typically less than 75 fpm, while the larger mesh sizes, such as 4 mm pellets, can function at 100 fpm. Activity is an indicator of the capability of the particular adsorbate to provide surface loading. Higher values show a generally higher capability to provide surface loading. All virgin vapor phase activated carbon filter media are capable of producing non-detectable effluent quality for adsorbates, which are cost-effectively adsorbed.Â Re-activated carbon media are available for applications where lower capacity and less stringent effluent quality will permit better cost-efficiency. For more information about TIGG’s Vapor Phase Activated Carbon Filter Media, call 1-724-703-3020 or click here to contact us.